Today we’re joined by Lori Grenville from author P.J. MacLayne’s paranormal Free Wolves series. Helping rescue unhappy female shifters from packs was just an ordinary day for me. But I can't believe she got me involved with saving the life of an alpha. Alphas and I don't get along. They despise what I stand for. So to think that she got me to put up my life as security for an alpha is craziness. That I stand up for the ones that can't stand up for themselves, give hope to those that have lost all hope. Sounds saintly, doesn't it? But I'm no saint, and sometimes I resort to less than legal tactics to get the job done. I don’t like being short and having to look up at everyone. I mean, hanging out with these big male wolf shifters can give me a literal pain in the neck. When she had me crawling into the bed of the most powerful alpha in all of North America, that was pretty weird. Of course, it was strictly business, and I made that clear to him from the get-go. Not that he was interested in me. Not as a bed partner, anyway. Still, it was a risky move on her part because it could have gone badly. Yep. She tried to talk me into having romantic feelings for the wrong guy. I set her straight, of course. Not that I have time to have romantic feelings for any guy. That my undercover status will be blown in the middle of a job. If that were to happen, I wouldn’t be the only one getting hurt. Besides the obvious of completing a rescue? Going for a run in wolf form in an old forest. I’d have to dodge shrubs and young trees as I darted from one patch of sunshine to another. I could stop and drink water from a clear stream whenever I got thirsty. The bit about my mother. I still want to locate her. If I could rewrite that part, I’d find her among either the Jaeger or Destin pack females. It would make for a happy ending. Or happier, maybe. Elder Jaeger. He’s no alpha. How the heck does he keep one of his betas from challenging him for pack leadership? He’s got to have some dirt on them and I wish I knew what it was. It might enable me to do some manipulation of my own. For the betterment of the pack, of course. Interesting question. Obvious answer would be Counselor Carlson, but I don’t think I could live with all the restrictions his position puts on him. What kind of life is it if you are surrounded by bodyguards all the time? I’ll say Elex Destin instead. He may have had a rough start in life, but he’s found what he loves to do and he’s good at it. And he won’t allow himself to be pressured to be something he isn’t. Born and raised among the rolling hills of western Pennsylvania, P.J. MacLayne still finds inspiration for her books in that landscape. She is a computer geek by day and a writer by night who currently lives in the shadow of the Rocky Mountains. When she's not in front of a computer screen, she might be found exploring the back roads of the nearby national forests and parks. 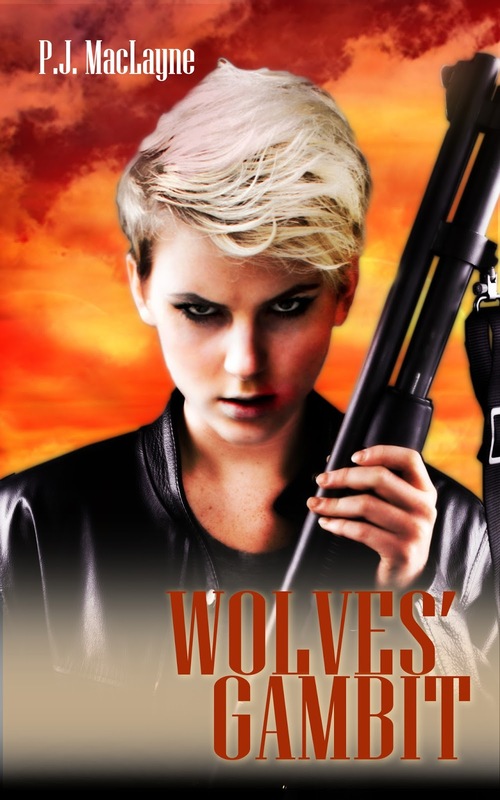 In addition to the Free Wolves’ stories, she is also the author of the Oak Grove series. Read more about her and her books at her blog. And a Giveaway! In celebration of the release of Wolves' Gambit, one or more lucky people will win an e-book version of Wolves' Pawn, the first book of the series. You can enter here. It's time for me to go into hiding for a while. Sit back, relax, recharge, wait for things to settle down. At least until I get chosen for another mission. Wolf-shifter Lori Grenville was rescued from near-slavery and a brutal pack leader by the Free Wolves. To pay back the favor, she's dedicated her life to helping others in the same situation, leading shifters to safety and a new start, risking her life in the process. She's faced down alphas and has no qualms in undermining pack structure. Now she's challenged with the task of restoring an alpha to his rightful place. If she gets it right, she can stop a war from ripping apart two packs and spreading across an entire state. If she fails, she'll be among the first to die. There's still the option of walking away and letting the Jaeger and Destin packs destroy each other. That means she'll fail in her original mission of rescuing the daughter of the Jaeger alpha before the girl is forced into marriage for political gain. Lori hasn't failed in a mission yet. This one may be the exception. Although Wolves' Gambit is the third book in the Free Wolves series, each book can be read as a standalone. Happy to have you and your werewolf, P.J. !